It wasn't long ago that the PC was the only choice you had if you wanted to play games online. However, late in 2002, PlayStation 2, Xbox, and GameCube introduced online capabilities. The latest generation of consoles all have features that use the internet to enhance gameplay. Online console games are common, with Microsoft's Xbox Live and PlayStation Live service leading the way. A few titles can be played across platforms, such as Final Fantasy XV, in which PlayStation 4, Xbox One, and PC users explore the same online world. That said, PCs still offer the largest selection of online games, and some of the most popular online games, such as World of Warcraft, are exclusive to the PC. Of course, there are many things to consider before deciding on a gaming platform. Foremost among these is deciding which games you want to play, how much money you want to spend, and whether you need a PC for other purposes. Ideally, having both is the best solution, but not everyone can do that, so here is a quick comparison of the two. The most obvious advantage consoles have over PCs is cost. The majority of consoles sell for well under $500, often with a couple of games in the bundle. A PC that is adequate for running the latest games can easily cost twice that much. The second most obvious advantage is simplicity. Let's face it, PC gaming can be a technical nightmare compared to console gaming. People can take a console home and be playing a game within minutes. There are no operating systems to configure or drivers to update, and better still, no purchasing a game only to find out that it isn't compatible with your PC for some obscure reason. Multiplayer gaming is made easy with companies like Microsoft and Sony offering online services for their products. Consoles come equipped with a network card, which makes it simple to connect to the internet to get into a multiplayer game. Another appealing thing about consoles is that many people prefer to play games sitting on the couch, or they want to play with friends in the same room. While these things are possible on a PC, consoles are better suited for this use out of the box. Console games are more readily rented than PC games and more easily returned to the retailer if you're not satisfied with them. It is difficult to return PC games because they are easy to copy. Console games tend to have a relatively low learning curve. You might need fast thumbs, but you certainly don't need to spend hours in a tutorial trying to learn how to operate basic game functions. Although sealing everything into one unit keeps a console simple, when some of the components inside the box become dated, there's no way to solve the problem without replacing the entire console. In most cases, upgrades that could prolong the life of the system are not an option. Consoles perform one task well, where PCs can be used for an extremely wide range of things. Some console manufacturers are trying to make them more flexible, but it is doubtful they will ever support the staggering variety of applications that are available for PCs. There is a distinct lack of interconnectivity between the different console brands. Many games are available for one type of console but not others, and when it comes to online play, each is typically restricted to its own network. This means that people with Xboxes can usually only play against other people with Xboxes. One of the biggest advantages the PC has over consoles is that there are a lot more games available for the PC than there are for consoles, particularly when it comes to multiplayer online games. Not only are the vast majority of MMOGs designed for the PC, but PC gamers have the option to play MUDs, email games, browser games, and a wide variety of titles that are distributed digitally or available as free downloads. Another clear advantage PCs have over consoles is that you can use them for a lot more than playing games. If you like to modify games or edit maps for them, a PC is essential. PCs are always on the cutting edge of gaming technology. The current generation of consoles with high-definition capabilities briefly narrowed the gap, but well-equipped PCs continue to offer superior graphics. High-resolution computer monitors and the latest multicore processors and dual GPU solutions make it possible to build a remarkably powerful gaming system. Even if a console offers incredible technology upon its release, there is no way for it to compete with the rapid hardware advancements that have become a way of life in the computer industry. 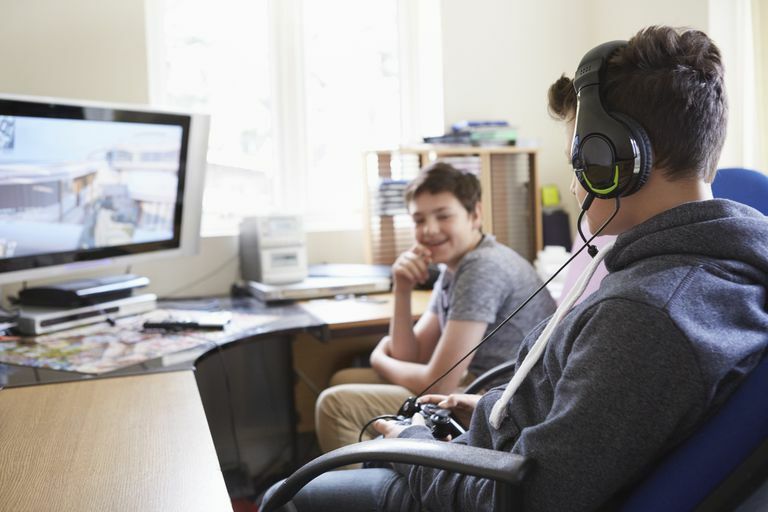 When it comes to online gaming, PCs give people a variety of ways to connect to the internet and to one another that aren't restricted to proprietary services or software. Different brands of computers and operating systems usually communicate well with one another. This is different from services like Xbox Live, for example, which is the only option available to Xbox users who want to play online and is closed to everyone who doesn't have an Xbox. As your PC ages, there is a reasonable chance of extending its gaming life with a component upgrade. While PCs have come down in price over the years, they are still expensive compared to consoles. There are ways to economize on a PC, but it's not easy to get the cost of a PC down to a price comparable to even the most expensive console. Computers are becoming more user-friendly, but eventually, every PC gamer encounters some technical complication that interferes with their gaming, be it a device driver that needs updating or components that are incompatible. PCs are much more vulnerable to viruses and other security breaches. Installing a game on your computer is always a bit of a gamble. You never know if it's going to work until you play the game, and even then, in the back of your mind, you're expecting it to crash at any moment. Unlike most console games, PC games have the potential to be ridiculously complicated. This can give a game depth, but it can also result in tedious arrays of keyboard commands and lengthy tutorials that you must endure when learning how to play. PC games are often not well suited for playing on the couch, especially given that the mouse and keyboard are the preferred PC game controllers. Unlike console games, you also won't find many PC games that support two players on one machine at the same time.